Air Conditioners can significantly increase electricity bills is a fact that is known to many people, but still many people buy it thinking that buying an air conditioner has become a necessity. While we can agree to an extent to the fact that temperatures have increase a bit in last century, but it is not that the life was difficult when there were no air conditioners. For a long time, people in India, especially those living in hot and dry climates used to rely more on desert air coolers. The coolers not only cooled the rooms, but also kept the electricity bills low. Consuming about one tenth the amount of electricity as compared to air conditioners, air coolers were not a big dent on the pocket as compared to air conditioners. So if you are someone who is concerned about rising electricity bills due to air conditioners, and you live in an area that is hot and dry, switching from an AC to air cooler can be the easiest energy saving option. Air Coolers are way cheaper as compared to Air Conditioners. They cost about 80-85% less as compared to Air Conditioners, thus making them very cheap to install as compared to an air conditioner. For a 200 sq ft room, a right sized air cooler would cost about Rs 6000-8000 whereas an Air Conditioner would cost about Rs 35000-40000. Even if we compare electricity consumption, air coolers consume 80-90% less electricity as compared to air conditioners. In the example mentioned above, a 1.5-ton AC would consume about 1.2-1.5 units in an hour, whereas an air cooler would consume just 0.2-0.3 units in an hour. 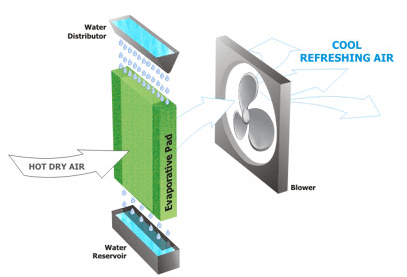 Air Conditioners by design cool the internal air. They take the internal air in a room and cool it down to the temperature set on the thermostat. They also remove the moisture from the air and make it dry. So all in all, the same dry air keeps getting circulated in the room. There is no option to get fresh air from outside while using air conditioner. Whereas in case of Air Coolers, fresh outside air is taken, cooled and pushed in the room. Fresh air is taken from outside and passed through an evaporative pad containing water. The hot dry air cools down when it comes in contact with water on the evaporative pad. Although there is no option to control the temperature in air coolers, but it always supplies fresh air. If going green is something that you are concerned about, then Air Coolers are the best option for you. Air Coolers use water as refrigerant, whereas Air Conditioners use CFCs or Chloroflurocarbons that are harmful for environment. Although plans are being made to phase out use of CFCs as refrigerants, but implementation of the same will take time. The easiest way to be green is to use Air Coolers. Even if we consider carbon emissions for generating electricity, use of Air Coolers turns out to be a greener option because it uses 80-90% less electricity as compared to Air Conditioners. The most common place where people install desert air coolers is on one of the windows in a room. But at times there are situations when there is no window or a very small window in a room. In case you have option of setting up an air cooler on the terrace, then you can set up a big air cooler on the terrace with a pipe/vent system to deliver air in all rooms. Such a setup will also help reduce the sound in a room generated by air coolers. If you live in an area that is hot and dry, air cooler is the best option. It not only helps reduce electricity bills, but also helps improve the air quality in a room. And on top of that it is the greenest option available to you to opt for.